It is so good to sit down and write to you. I am so happy that you are enjoying reading about my adventures in Paris. I appreciate all you comments. I really enjoy reading them. Yesterday we gave ourselves an easier day and "only" went to the Louvre. We slept in and went in the afternoon, and by then there were millions of people there! But we didn't care. We wanted to take an easy peek at what was there, and then go back a couple more times. It took time for us just to figure the place out, and I wouldn't say we know that much yet! It is truly enormous! My favorite part so far, and which I will return to is the apartments of Napoleon and Josephine. I thought I had seen opulence before, but these rooms are over the top in ways I couldn't even have imagined! I wish I had pictures, but they do not allow flash, and the rooms are somewhat dim. We tried, but they turned out fuzzy. Today, we took a subway, and then a train out to Vernon. 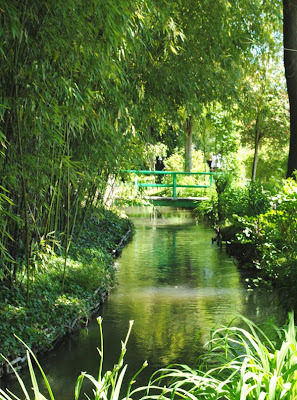 Giverny, the home of Monet's Garden, is on the outskirts. I didn't know what to expect of it. I was really surprised at how many people were there. Thousands! The gardens were full of tulips, lilacs, forget me nots, peonies, violas, pansies, and many flowering plants I do not know the names of . It is a riot of color! The sun was so bright, and the sky so very blue, it was like being in heaven! The Hydrangeas were in bloom! It was a riot of color! 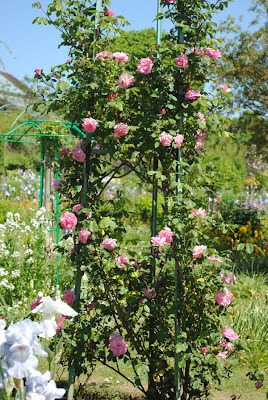 And the roses were just begining to bloom. The farmhouse is nothing short of inspirational to me. In the family room there are many of Monet's painting hanging on the walls, which my husband assures me are prints. But they look incredible anyways. I was standing there forever, just imagining Monet in there, by the large window that let in so much light, considering a painting he was working on. The dining room and kitchen are amazingly colorful. The bedrooms upstairs with windows flung wide, were open and refreshing. I may have been imagining things (and that's o.k....) but I sensed such a beautiful energy of creativity still there. I drank it in and all I could think about was getting to some brushes and paints and just playing on canvas! I wish I could spend more time with you, but the days are long here, and I am so tired. Tomorrow is another day here in Paris. We are planning a tea for Tea Cup Tuesday. So I will be posting where we have tea and pastries tomorrow. So please come back and see that. We are also going to Notre Dame, and maybe taking a bateaux down the Seine! Here I am looking out of a bedroom window on the second floor. What a view! Thank you again for coming by. You look like a young girl there at the window, my friend....and the flower photos are so stunning they take my breath away. I am glad to read you took an 'easier' day and to think of you having tea and delicious pastry tomorrow is just so amazing. 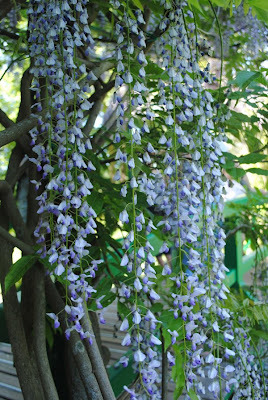 Thank you for sharing and I have no doubt that you did, in fact, feel the creative energy there in that magical home and garden. I love that picture of you in the window with that beautiful smile on your face! After seeing ALL that you've observed so far, no wonder you're grinning like a cat! The flowers, the art, Monet, and now Teacup Tuesday from Paris. Be still my heart! I won't be participating this week and I'm still in the US....bad, me! Have sweet dreams and I'll be checking in on you tomorrow. 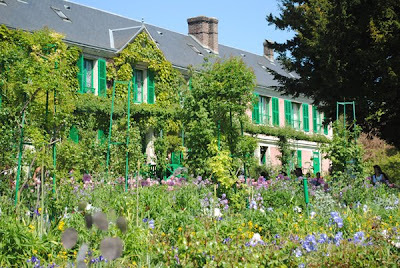 What am amazing trip you are having, the visit to Monet's house must have been incredible. And thanks for the photos they are just beautiful. Also I think I missed commenting on the flea market post, what an incredible place that looks! Excitement (and potential bankruptcy!) at every turn. Enjoy your Parisienne 'tea time'! So glad you made it to Giverny! I was gobsmacked by the gardens. Just a riot of color and aroma - marvelous! We were lucky enough to be there right at the end of April when everything was just coming into bloom - and the waterlilies just bowled us over. I wasn't that thrilled with the farmhouse - too many people and couldn't really see anything. But, all-in-all a wonderful spot. I have been to Paris seven times - and gone to the Louvre every time - and still haven't come close to seeing it all LOL. Can't wait to see your tea party pics! - and do take a ride up the Seine if you have time - a night time one is stunning - and the bridges - ooh la la! 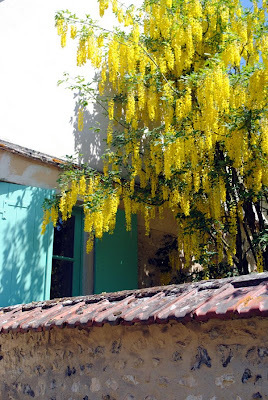 Your surroundings in Paris and Giverny are very suited to you as your happy smile denotes. Being in another world (France) is truly amazing and inspirational. Enjoy your time and soak it all in. What a fabulous trip, Terri! I'm so happy for your opportunity and I'm glad you are telling us about your journey. Sounds like so much fun!!! It looks like you are having a wonderful trip! I hope to go to Paris in my lifetime..we spent a month in London but for some reason never crossed over to Paris. Have a great time exploring the sights and travel safe. Wow..Super Wow!! thanks for sharing such a dazzling radiant post..inspiring beuaty and MAGICAL..oh how I wish i was there..but i am happy to dream and be there in spirit and read about your wonderful adventures!! Have a wonderful time..and may magic greet you at every corner!! ENJOy!! 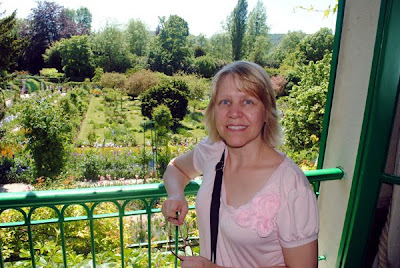 Hi Terri, thanks so much for sharing your beautiful photos, the gardens are amazing and you look so sweet in the photo. Can hardly wait for tomorrow post, YUM!!! I am really enjoying your photo journey in Paris. What a beautiful place to be. Keep having a lovely time. WOW! Too bad about the fuzzy pics!! The garden is gorgeous! 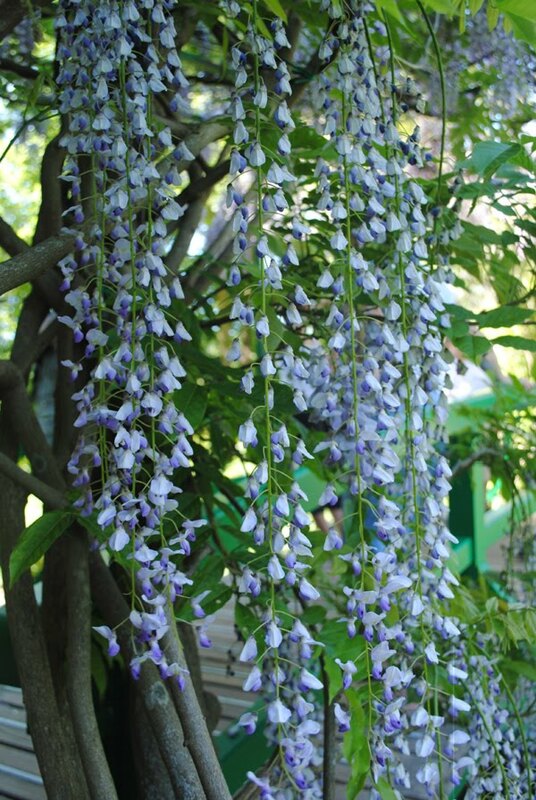 I especially love what I think might be the blue wisteria! ENJOY, and thanks for bringing us along! Breathtaking! Can't wait to see the tea. Enjoy your trip! Oh Terri, how awesome is all I can say. Such beauty you are sharing. The amazing gardens of color or just wonderful. Can't wait to see your tea party. Wish I was in your pocket!! Have a wonderful time, don't wear yourself out, NO DO wear yourself out, how often do you get to go to PARIS!!? I truly feel like I am right next to you on your journey. What a wonderful way to start my day!! Can't wait for the next post!! Oh, Terri, you have gone to the places I would love to visit most! I have books on Monet and have seen some of his paintings in San Francisco, but cannot imagine how wonderful it must be to see his home and gardens in person! Thank you so much for taking the time to share this with all of us each day! What a lucky girl you are! The photos are wonderful....they depict the gorgeous flowers and sites so beautifully! 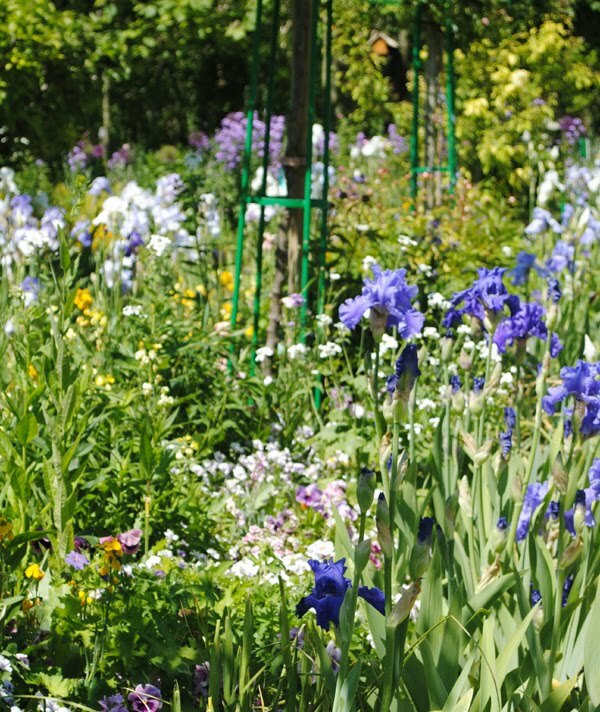 Love reading about your trip to France and your photos of Monet's Garden are beautiful and inspirational. What lovely photos! This is one thing I did not do when I was in Paris. And the Louvre? That was our last museum and by then, we were museumed out. What a beautiful photos Terri. Oh to be walking through the garden's at Giverny! wish I were there too! WOW!! What an amazing trip for you and your take on things sounds so much like the things I would appreciate and enjoy. The gardens of Monet look just as you described, a "riot of color". It appears the gardens are not so precise as many public gardens are kept, and I like that. Loved the pictures Sis you looked beautiful as always and the flowers were spectacular. I know what you mean about the energy it has to be amazing there. Can't wait to read the next post, glad you are having a wonderful time. Love you. I found your blog by visiting Martha's Teacup Tuesday today. This is my first time to your blog and I really love reading through your previous posts. Looks like you and I share some of the very same friends. I'm not sure why our paths have not crossed before. Be sure to have fun in Paris. You are very lucky and you really ARE having a great year. Awesome photos, too. Looks like you got the new camera going just in time. Have an amazing trip and I'll be back soon. Beautiful gardens, Terri. I really did love the Louvre! I know you will try to see Mona Lisa. I was totally still surprised it was so small - even tho I had read about it. Hugs, and be sure to rest! What a wonderfully beautiful trip! Now I must see this garden. I didn't know that it actually existed! Thank you for sharing photos of your trip. 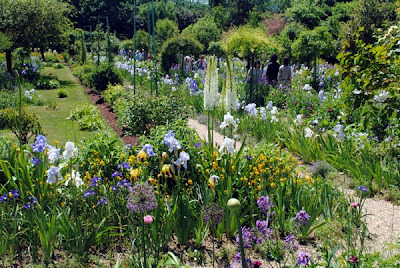 we went to Monet's garden last week too... and i must say i enjoyed it tremendously as well !!! !i've posted loads of photos on my blog too. Lovely posts here. I'm sure to return! this was one of my favorite places to visit when I was in France. I also loved Auberg (sp?) where Vincent Van Gogh lived and died. 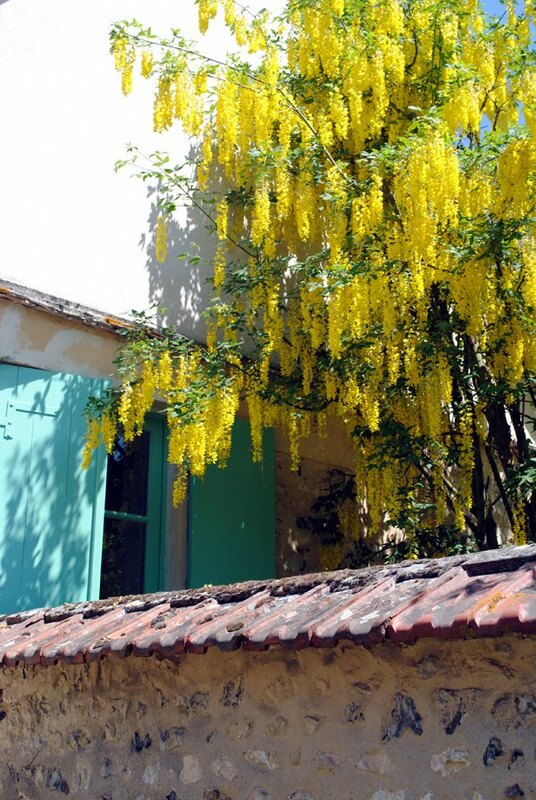 Loved looking at all your photos of France.